See the difference for yourself. Step into one of StoneGate Homes' truly unique models, and gaze upward at the 10-foot and vaulted ceilings that are standard on every model. Note the many windows that give the home an airy, open and bright feel. Observe the interesting, convenient niches that add space and flair to each model's personality. You can select from any of our exceptional designs or bring us ideas for the special plan you have in mind. Either way, we'll supply the craftsmanship to turn your dream home into a reality. Designs ahead of their time. 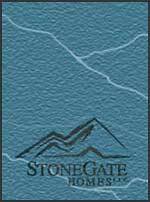 StoneGate Homes' unique Southwestern and Santa Barbara architectural styles stand out with beautiful stucco exteriors with striking tile roofs, the first of their kind in Colorado Springs. With a variety of unique floor plans and intriguing options to reflect your individual taste, our single-level-living homes start at 4000 square feet. Walk out lower levels are available on selected lots. StoneGate Homes offers these limited edition signature homes at $700,000. Stucco exteriors, distressed doors and cabinets add to the old world charm . . . These estate like homes and towering rotundas capture the essence of authentic Mediterranean architecture. The larger homes in this collection have 2 bedrooms on the main level. Raising the Standard in Quality, Design, and Innovation . . . .
. . . Discover the Difference.